Turning off I-25, south of Truth or Consequences, drivers head west through long, open stretches of creosote bush and honey mesquite. On stormy days the scent of rain on that Chihuahuan desert scrub sneaks its way into cars and trucks, even through closed windows. It’s only a 30-minute drive from the interstate to Hillsboro, but the trip is reminder that small communities in the southwestern part of the state still have a close relationship with the land—and with history. Only about 100 people live in Hillsboro, which today includes a smattering of houses and galleries, a post office and the General Store and Cafe on the south side of Percha Creek. 1884 until the 1930s was the county seat of Sierra County. local air quality. 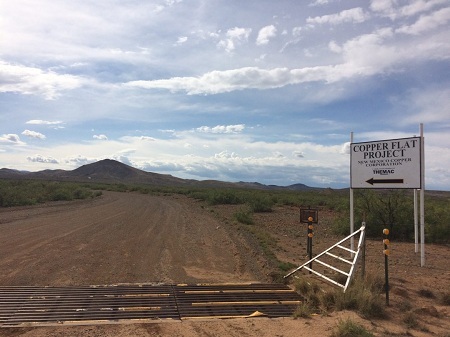 According to the company’s plans, the mine would produce about 100 million tons of copper ore over its estimated 16-year long lifetime, and the existing pit would be enlarged from 102 to 169 acres. According to a statement from THEMAC’s Chief Operating Officer, Jeff Smith, the mine won’t harm the area’s groundwater or streams. He said the mine is designed to be a “zero discharge facility,” and added that the new tailings facility, process pipelines and the fuel and process tanks will be constructed in lined facilities. He also said that Sierra County, the towns of Williamsburg and Elephant Butte and more than 50 state legislators support the project. the U.S. Bureau of Land Management. Under the National Environmental Policy Act, or NEPA, federal agencies are required to study major projects like mines and the impacts they might have before approving them. Released in November 2015, the draft Environmental Impact Study (EIS) for the Copper Flat mine looked at how the proposed open pit mine—and its mill, waste rock pile, stockpile and associated facilities—might affect everything from local water supplies and wildlife to the economy. even sent tremors along the the Lower Rio Grande more than 15 miles away—and as far downstream as Las Cruces.The Elephant Butte Irrigation District and the New Mexico Pecan Growers, for example, both commented that pumping groundwater for the mine could affect water rights owned by its members along the Rio Grande. Comments also came in from U.S. Sens. Martin Heinrich and Tom Udall and the U.S. Environmental Protection Agency. In its February 2016 letter to the federal Bureau of Land Management, the New Mexico Interstate Stream Commission noted that BLM didn’t adequately consider the project’s impacts on New Mexico’s ability to meet its Rio Grande water delivery requirements to Texas. Under the 1938 Rio Grande Compact, Colorado, New Mexico and Texas share the river’s waters. In a case currently before the U.S. Supreme Court, Texas has sued New Mexico, claiming that by pumping groundwater that’s connected to the river, New Mexico is taking water that legally belongs to Texas. received more than 1,000 comments, BLM’s Land and Minerals Supervisor Doug Haywood said. Once the comment period closed, the agency evaluated each comment it received. BLM employees responded to issues the best they could, said Haywood, and then referred others to the company. Currently, BLM is awaiting the company’s answers to about a dozen questions. The decision in question is whether BLM will allow the company to move into the next phase—completing a final EIS—or require that it slow down and write a supplemental report. Under the National Environmental Policy Act (NEPA), a Supplemental EIS is required if a project changes substantially or new information arises. baseline data for wildlife and endangered species or the area’s groundwater resources. She added that models underestimated the mine’s future impacts on nearby wells and streams like Percha Creek and Las Animas Creek, a tributary to the Rio Grande that flows across Ladder Ranch. The center represents Turner Ranch Properties; Turner’s Ladder Ranch is adjacent to the mine. She also said new information has come to light since the Draft EIS was released in November 2015. Park said that the mining company claims that the existing pit lake—which is about 39 feet deep and covers 5.2 acres—will be expanded only onto private, rather than BLM, land. That might relieve the company from certain state water quality requirements. The company has also agreed to lease 3,000 acre-feet of San Juan-Chama water from the Jicarilla Apache Nation in northwestern New Mexico. The tribe has rights to water that is piped in tunnels from the San Juan River and into the Chama River, which flows into the Rio Grande near Española. According to the agreement, that water wouldn’t be used at the mine, but would “offset” water depletions in the Lower Rio Grande. That is, it would replace water that is lost to the river because of pumping. That lease, signed July 14, 2015, also includes a provision that New Mexico Copper Corporation will give hiring preference to tribal members. The Draft EIS, said Park, doesn’t account for impacts that water transfer from the tribe to the company would have.Lastly, Park said that BLM didn’t provide the U.S. Fish and Wildlife Service with information related to endangered species until after the draft study had been published, and just weeks before the public comment period ended in early April. In a July 6, 2016 response to BLM, the Fish and Wildlife Service questioned how groundwater pumping might affect rare fish in Percha and Las Animas creeks. The Fish and Wildlife Service enforces the federal Endangered Species Act. The agency also raised concerns over groundwater pumping impacts on the Lower Rio Grande—and noted that any further loss of Rio Grande Cutthroat Trout in Las Animas Creek might trigger the species to become listed for protection under the Endangered Species Act. For now, Haywood said the BLM has to wait for the company to finish answering all its questions before it can decide whether the next step will be a Final EIS or a Supplemental EIS. original publication with a statement from THEMAC’s chief operating officer.